An ideal body conformation, extra-plush fur, and a heavenly blue-grey color that is set off by orange or copper eyes have given this cat a consistent number-one ranking in the Shorthair popularity stakes. The British Blue Shorthair evolved during the late nineteenth century from breeding programs using the very best street cats. It made an early appearance at shows, but the scarcity of studs during World Was II, and outcrosses to other breeds after the end of the war, caused the type to deteriorate. The introduction of Blue Longhairs into breeding lines resulted in some improvement, although the fur tended to be too long. It was not until the 1950s that very selective breeding was, finally, able to restore the original Blue Shorthair type. A sharp-witted and particularly affectionate cat, the British blue Shorthair makes an excellent companion and confident that some owners report has a hankering for the quiet life. 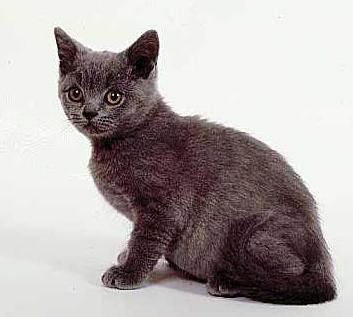 The Chartreux is considered by some associations to be a true variety of the British Blue, but others judge it by the same standard. It is thought to have been developed in France during the Middle Ages by the monks belonging to the monastery of La Grande Chartreuse (famous for its green liqueur), using cats imported from North Africa. It is given its own class in North America, where a sturdier cat than the British Blue is called for, with a higher proportion of grey in the coat, and a face that is less rounded. In Great Britain, selective breeding has brought the Chartreux so close in type to the Blue Shorthair that no distinction is made between the two. To preserve the breed type, occasional outcrossings to Blue Longhairs and Black Shorthairs are recommended in some countries. The fur is short and dense. At one stage, a dark state-blue color was accepted, but now the standard requires a medium to light blue. There should be no tabby markings. The paws are large and round with blue paw pads. Round and broad, with a short, straight nose and blue nose pad. Well-developed chin. Medium in size, and round-tipped. Large and round; color should be copper or orange. A perennial favorite, the British Blue Shorthair has a well-balanced, but still sometimes mischievous, disposition. Selective breeding of the Blue Shorthair has produced a body conformation that is a perfect example of the British Shorthair type. British Shorthair kittens are particularly irresistible and pretty. They may have faint tabby markings that should disappear within a few months. In some countries, this cat is allowed to retreat into the monastic seclusion of its own class.